Christmas is a Golden time of year. Olde Golden Christmas begins at 6:30 pm on November 30, 2018, with the candlelight walk. Thousands of citizens and visitors will start at the Foothills Art Center, and carol their way down Washington Avenue, candles in hand, to the Golden Visitors Center where local merchants and civic groups will greet the revelers with hot cider, egg nog, cookies, activities, exhibits and more to instill warmth and good Olde fashioned Golden Christmas spirit. The mayor's elf helper will flip a switch, and thousands of lights on Washington Avenue, at the Visitors Center and along the Clear Creek Trail will illuminate the night to the crowd's cheers, oohs and ahs. Along the way and afterwards, businesses and groups sponsor special events and sales. Every year, Santa Claus is seen enjoying himself at venues up and down the avenue. And why not? Golden's Candlelight Walk is renouned as the best way to begin the holiday season. The celebration will continue at 10:30 a.m. on Saturday, December 1, 8 and 15 when shoppers will line the streets for 45 minutes to watch the Olde Golden Christmas Parades wind from the Golden Visitors Center up Washington Avenue. The paradse feature tractors, fire engines, dog carts, mounted Santas, marching bands and more. Meanwhile, shopkeepers will offer treats, music, cider, hot chocolate, visits with Santa and bargains. Dogs will pull kids in carts, and there will be free horse drawn carriage rides through town on Saturday and Sunday afternoons from noon until 3. Victorian carolors will be singing up and down the Avenue from noon until 2. Meanwhile, back at the visitors center, visitors can mail letters to Santa, buy merchandise to support local civic organizations, and share open house refreshments with old friends and new. So skip the malls, and experience the magic of a traditional holiday celebration. 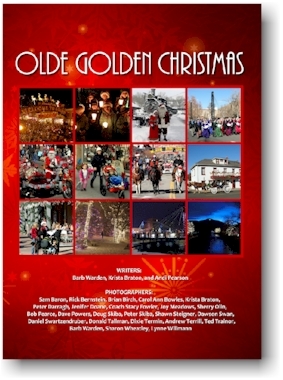 Welcome to an Olde Golden Christmas !